The Gothic Trilogy : Dracula, Frankenstein, Dr. Jekyll and Mr. Hyde (unabridged versions) in one volume ! Three Classic Gothic Novels in One Book only ! 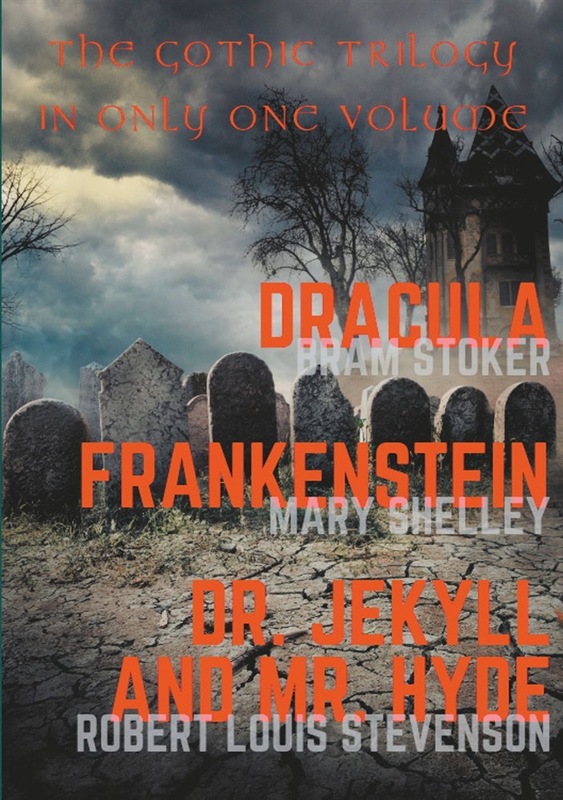 1) Dracula, 2) Frankenstein, 3) Dr. Jekyll and Mr. Hyde --all three classics complete and unabridged versions by Bram Stoker, Mary Shelley and Robert Louis Stevenson. 1) Dracula is an 1897 Gothic horror novel by Irish author Bram Stoker. It introduced the character of Count Dracula, and established many conventions of subsequent vampire fantasy. The novel tells the story of Dracula's attempt to move from Transylvania to England so that he may find new blood and spread the undead curse, and of the battle between Dracula and a small group of men and a woman led by Professor Abraham Van Helsing. Dracula has been assigned to many literary genres including vampire literature, horror fiction, the gothic novel, and invasion literature. The novel has spawned numerous theatrical, film, and television interpretations. 2) Frankenstein; or, The Modern Prometheus is a novel written by English author Mary Shelley (1797-1851) that tells the story of Victor Frankenstein, a young scientist who creates a hideous, sapient creature in an unorthodox scientific experiment. Frankenstein is infused with elements of the Gothic novel and the Romantic movement. At the same time, it is an early example of science fiction. Brian Aldiss has argued that it should be considered the first true science fiction story because, in contrast to previous stories with fantastical elements resembling those of later science fiction, the central character "makes a deliberate decision" and "turns to modern experiments in the laboratory" to achieve fantastic results. It has had a considerable influence in literature and popular culture and spawned a complete genre of horror stories, films and plays. 3) Strange Case of Dr Jekyll and Mr Hyde is a gothic novella by Scottish author Robert Louis Stevenson, first published in 1886. The work is also known as The Strange Case of Dr Jekyll and Mr Hyde, Dr Jekyll and Mr Hyde, or simply Jekyll & Hyde. It is about a London legal practitioner named Gabriel John Utterson who investigates strange occurrences between his old friend, Dr Henry Jekyll, and the evil Edward Hyde. The novella's impact is such that it has become a part of the language, with the phrase "Jekyll and Hyde" entering the vernacular to refer to people with an unpredictably dual nature: usually very good, but sometimes shockingly evil. Acquista Dracula, Frankenstein, Dr. Jekyll and Mr. Hyde in Epub: dopo aver letto l’ebook Dracula, Frankenstein, Dr. Jekyll and Mr. Hyde di Bram Stoker, Mary Shelley... ti invitiamo a lasciarci una Recensione qui sotto: sarà utile agli utenti che non abbiano ancora letto questo libro e che vogliano avere delle opinioni altrui. L’opinione su di un libro è molto soggettiva e per questo leggere eventuali recensioni negative non ci dovrà frenare dall’acquisto, anzi dovrà spingerci ad acquistare il libro in fretta per poter dire la nostra ed eventualmente smentire quanto commentato da altri, contribuendo ad arricchire più possibile i commenti e dare sempre più spunti di confronto al pubblico online.